Something to munch in front of the TV with a piece of bread or chips… no cutlery needed! – 1 spoon of mustard oil, salt. Wash the chicken and put it in a bowl. Massage the chicken pieces with mustard. Finely chop the onion and the garlic and add to the chicken with salt and the mustard oil. Mix all well. Fold the chicken wings to look like a folded knees (makes then easy to handle). Cover and leave in the fridge for 1hr. After the Hour, pour the chicken and all the content of the bowl in the oven tray. Place the tray in the oven (in the middle) at 200C and leave it there for 1hr without touching it. After the hour, turn over the chicken wings and leave in the oven for another 20 minutes. Switch off the oven and then cover the chicken with foil to keep it moist until it is time to serve. Do check if there is some gravy at the bottom of the tray. If there is, you should serve your chicken with it. If not, you can recuperate all the bits at the bottom of the tray to create a little gravy. To do this, remove all the chicken wings and put them in a separate bowl then cover to keep moist. Recuperate/scrape all the bits remaining at the bottom of the oven tray and place them in a pot with half a glass of water (50ml) and a tbsp of mustard oil, 2 or 3 chopped fresh tomatoes pepper and salt. Leave to simmer for about 5 minutes. Et voila! 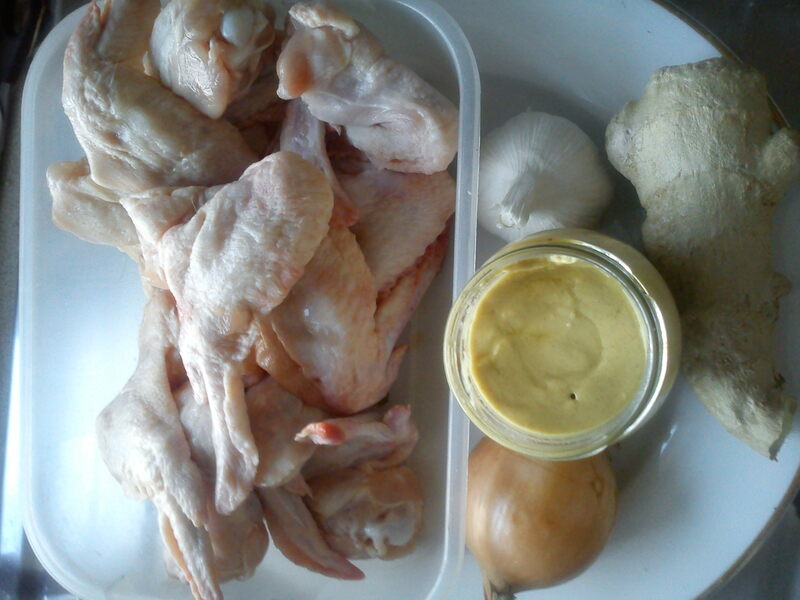 This entry was posted in Breakfasts & Brunches, Main meals and tagged Chicken, French mustard, Garlic, mustard oil, Onion. Bookmark the permalink.